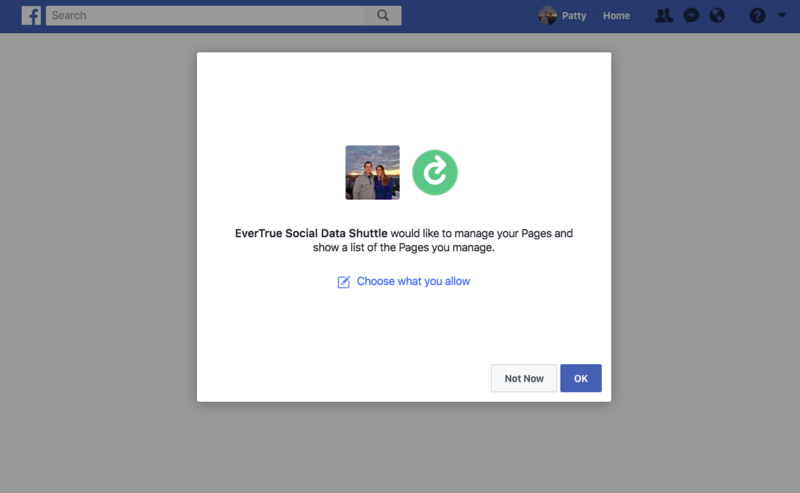 In order to track engagements (likes, reactions, and comments) with posts on your institution's Facebook pages, an EverTrue user must have administrative rights to authorize EverTrue to collect data. We recommend having an existing EverTrue user added as an Admin or Analyst to the page(s). To do this, you can have an existing Admin add you to the page using these instructions. Please remember that you must accept the invitation to become an Admin or Analyst to a page before moving forward. Once you've become an Admin or Analyst on a Facebook page, follow this simple process to authorize EverTrue to access your Facebook data. Navigate to the Facebook tab in EverTrue. Select the pink Actions menu on the top right corner and click Manage Facebook Accounts. You will be brought to a screen that lists the Facebook pages for your institution. This list is set up during implementation. Click the Connect Page Admin Facebook Account to authorize EverTrue to access the pages. You will then be re-directed to Facebook. You will be asked to log in and approve of EverTrue to receive your public profile and access the pages you manage. Note, this does not let EverTrue post to Facebook for you -- it allows us to track engagement on the posts. When you see the screen below, please click the OK button. EverTrue will only be able to access pages that match up with the Facebook URLs we've been provided during Implementation. With that, make sure you have Admin or Analyst rights to each of the pages that have been set up in EverTrue to monitor. If you cannot obtain permission to all of your monitored pages, see step 5 below. Once you grant these permissions, you will be directed back to EverTrue. You will see that any pages you manage have a Connected status in the Manage Facebook Accounts Dashboard and your name listed as an Admin. If there are pages that are not connected, an admin of those pages will need to repeat this process. EverTrue collects all posts for connected pages and refreshes them each night.